This report explores the role of traditional marine resources management in meeting both the goals of communities and those of national and international conservation strategies. 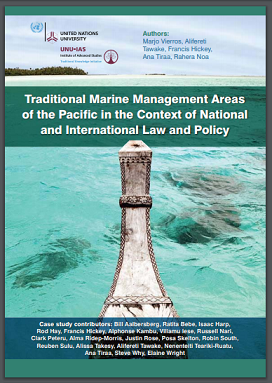 Specifically, it aims to inform policymakers and those working for international organisations and donor agencies about how traditional practices are applied in various Pacific Island countries, how concepts such as the ecosystem approach and adaptive management are incorporated, whether traditional marine managed areas (MMAs) are recognised by national law, and how and whether they are seen to contribute to national and international protected areas and conservation targets. The report also reflects on the issue of marine genetic resources, and access to and benefit-sharing of these resources.